It's a first class mailbox. Replacement mailbox for Fulton T2 mailbox. I looked in big box stores for the same replacement box. Disappointed to find either low end or very expensive designer mailboxes. Very pleased with quality and construction of the mailbox. I will get many years out of this box. Old Fulton T2 mailbox lasted 12 years before bottom started rotting out and started rust staining the mailbox post. This box replaced an existing fulton box that had the lid broke off.This unit fit exactly right, the screw holes lined up perfectly. This was a replacement for a mailbox that was damaged by a vehicle. Exact dimensions and well made. Our previous mailbox was also a Fulton and gave us many years of service.It did not survive a second round with a snow plow.Our new one seems to be another quality product and I am very pleased with the new size and color. This is a high-quality mailbox. I wish it had a magnetic lock, as our last mailbox did. We ordered 2 of them. With more than $50 in purchase price, I expected free shipping . Shipping costs were much higher than other sites. But I wanted the gunmetal color. We have 30 neighbors with mailboxes. I hope to convince them to order these mailboxes, so we don't have the hodge podge that we have now. After 16 years of dedicated service, my existing post mailbox expired from rust. I replaced it with a Fulton large post mount mailbox. The workmanship was superb, and the quality excellent. As a matter of fact, it was better constructed than the mailbox that it replaced which was more expensive when I purchased it 16 years ago. Great value for the money. Shipment and receipt was only several days from the order. Excellent, high quality mailbox to replace my old one. Shipment was very timely. This mailbox is so well made. It is sturdy, has a metal latch, a metal flag and metal flag holder. I found the Fulton Co. online after visiting my local big box stores where the mailboxes were inferior to this one. Fulton is a great company with great customer service. I am a very satisfied customer. We mounted this box on a cedar post and it is beautiful. Also LOVE that it is made in America. Thank you. 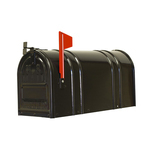 This is the only mailbox that meets our subsivision's standardized look's size and GRAY/ALUMINUM color. My original box was 6 years old and had rusted pretty badly, so it was definitely time to change it out. The new one had a little bit of a dent in one of the bottom back corners (likely due to handling or shipping), but since you don't really see it I decided to use it rather than request a replacement.